If you feel the constant pull of electronic leashes at work, you’re not alone. It turns out that many people are in the same boat while on the clock—and even off it it. I recently sat down with consultant and columnist Vicki Salemi to discuss that topic. A very brief excerpt of our interview ran on the New York Post. Here’s the entire conversation. VS: Get this, a study from 2015 said that the average US worker spends 6.3 hours a day on e-mail. What are your thoughts on that? And what does it say about us in terms of productivity and a society (workaholics, anyone)? PS: That number seems high to me and contradicts the research that I did for the book. In July 2012, the McKinsey Global Institute (MGI) released a report titled “The Social Economy: Unlocking Value and Productivity Through Social Technologies.” MGI found that knowledge workers on average now spend fully 28 percent of their work time managing e-mail. Regardless of the actual number, though, it’s hard to dispute the assertion that we spend more time than ever on e-mail. On average, we receive 120 to 150 e-mails per day—and that number is increasing at a rate of 15 percent per year. (Source: the Radicati Group.) Because of smartphones, it’s never been easier to check our messages while waiting for coffee, on line at the supermarket, or even while in the bathroom. It’s completely out of control. VS: Is it OK not to check e-mail on weekends and days off? PS: In short, yes. All communication is contextual and personal. In Message Not Received: Why Business Communication Is Broken and How to Fix It, I stop short of issuing edicts such as these. You have to do what works for you. Understand, though, that every time you read and respond to a late-night or weekend message, you’re implicitly saying that this is acceptable. Many organizations are starting to discourage or even ban off-hours e-mails. They realize that this constant frenzy of messages is causing employee burnout. VS: Are we totally abusing and overusing e-mail? How so? PS: Yes. We often prefer e-mail because it’s asynchronous. That’s just a fancy way for saying that we can respond to a message when it’s convenient for us. Both parties don’t need to be using it concurrently for it to work. We also often opt for it in lieu of personal conversations. Sending a file or link via e-mail is fine. Far too many people, however, use it to conduct “conversations.” In the process, they invite misunderstandings and arguments. Consider a 2006 series of studies by two psychologists, Justin Kruger, PhD of New York University and Nicholas Epley of the University of Chicago. They demonstrated that text-based communication only works about 56 percent of the time. VS: Should you put an “out of the office” (OOO) message on for the weekend if you know you won’t check your e-mail? You can always express your desire to unplug from work. There’s a ton of research that cites the benefits of doing just that. VS: What if your boss expects you to be available at all times? Do you just have to deal with it? PS: Great question and I address that at the end of the book. The short answer is no, especially in the long term. You can always express your desire to unplug from work. There’s a ton of research that cites the benefits of doing just that. If your manager refuses to respect your limits, you can always look for another position somewhere else. Nowhere is it written that you have to be available 24/7. More and more workplaces are recognizing the drawbacks of these types of pressure-packed environments. VS: What are the negative effects of constantly checking e-mail? For instance, greater anxiety and stress, plummeted productivity, etc. PS: Constantly checking e-mail (or texts, Facebook, etc.) inhibits productivity. Put differently, this is what Mihaly Csikszentmihalyi calls flow or a state of “optimal experience” in his eponymous book Flow: The Psychology of Optimal Experience. To do your best work, you need uninterrupted time, not two minutes here and there. Checking e-mail on vacation prevents us from unplugging and recharging our batteries. Many workers can’t stomach returning to work after a weeks’ vacation with 700 unread messages—with more coming all the time. As a result, their vacations aren’t really vacations at all. This is simply unhealthy. Beyond that, e-mail induces stress—and not just among American workers. LexisNexis in 2010, the company conducted its second International Workplace Productivity Survey. Its findings confirmed what many have long suspected: e-mail is very distracting. 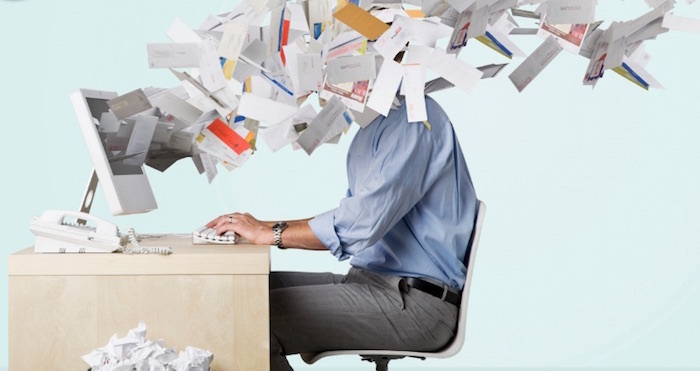 More than eight in ten (85 percent) white-collar workers in Australia and more than two-thirds (69 percent) of South Africa’s professionals say the constant flow of e-mail and other information is distracting, making it more difficult to focus on the task at hand. Six in ten workers in the U.S. (60 percent), U.K. (62 percent), and China (57 percent) echo this sentiment. E-mail also gives the sender the appearance that all messages have been received when, in fact, nothing can be further from the truth. (This is one of the reasons that I titled the book Message Not Received.) From the same LexisNexis survey, a large majority of workers in every market admit deleting or discarding work information without fully reading it. Nine out of ten (91 percent) U.S. professionals say they have done this, as have eight in ten workers in China (84 percent) and Australia (82 percent), and almost three-quarters of professionals in the U.K. (73 percent) and South Africa (71 percent). Originally run on Huffington Post. Click here to read it there.